Our Mountaintop Zipline Tour lets you experience higher vantage points and longer lines than ever before. That means you will have the best view of all the incredible fall foliage in the Smoky Mountains. With 360-degree panoramic views, you will be surrounded by gorgeous views everywhere you look. 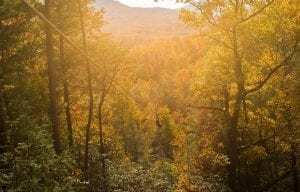 The leaves tend to peak at higher elevations first, so if you’re planning to visit the Smoky Mountains in October, CLIMB Works is your number one place to go to see the fall colors. Your adventure begins with an ATV ride up the side of the mountain. Along the ride, you will gain 400 vertical feet over half a mile! You will be driving right through the fall leaves and get to experience fall in the Smoky Mountains up close. In addition to the ATV ride, you will get to cross 4 aerial bridges that are high above the ground. 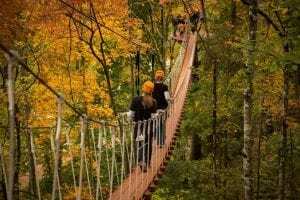 This is also a great opportunity to take in the beauty of fall, as we are surrounded on 3 sides by the Great Smoky Mountains National Park and the sky bridges offer a bird’s eye view of the fall foliage. Everything is more special when you get to share it with a friend or family member. That’s why our Mountaintop Zipline Tour is a great way for you to celebrate fall. On this zipline tour, we have dual ziplines that allow you to zip side-by-side with the person of your choice. You can enjoy the experience with your loved one right beside you, which just makes it that much better! The smiles will never leave your faces as you take in all the stunning fall scenery. Fall is a picture-perfect season in the Smoky Mountains, so it’s only natural that you get some pictures while you are here. Our Mountaintop Zipline Tour offers incredible opportunities to capture the perfect picture. While we do allow you to bring your own camera, it must be secured with a strap or other means at all times. However, the best part about ziplining with us is that you don’t have to have your own camera to get photos! We take pictures of you ziplining throughout your adventure that are available for you to purchase. You will have a photo of you among all the stunning fall scenery that you can cherish for years to come! Don’t miss your chance to celebrate fall in the Smoky Mountains with us at CLIMB Works! Learn more about our Mountaintop Zipline Tour and book your trip today.